At this moment there are more than a million infertile couples in India trying for a conception. IVF (in vitro fertilization) or ‘test tube baby‘ is the magic word for infertile couples desperately desirous of a child. Through this technology which is a boon to mankind, many who had no chance of having their own child, are now proud parents. Though by IVF, a couple has up to a 60% chance of success, the success rate may vary from couple to couple and may not be the same for all couples. Failure of Fertility treatment for more than 3 years. 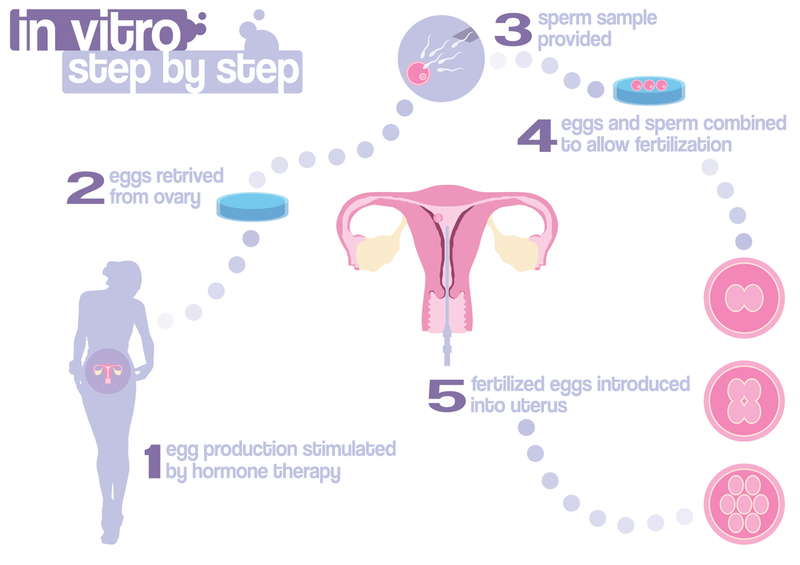 What Happens In An IVF Treatment Cycle? Typically, an IVF cycle consists of ovarian stimulation, egg collection, fertilization, embryo culture and embryo transfer. Ovarian stimulation consists of daily injection of hormones to the female partner with frequent clinical and ultrasonographic monitoring. This usually continues for 10-15 days. Egg retrieval is performed under anesthesia through the internal route. There are no incisions or scars. The egg and sperm are either mixed (IVF) (Figure 1) or the sperm is injected into the egg (ICSI-intracytoplasmic sperm injection) (Figure 2). The fertilized egg forms the embryo. The embryo is cultured in the laboratory for 2-3 days (Figure 3). Two-three best embryos are selected and transferred into the womb (uterus) on the second or the third day. The pregnancy test is done 14 days after the day of embryo transfer. What Is The Success Rate of This Process? It all sounds so logical and definitive that one would expect success in every case! But unfortunately, this is not the reality. One must understand that in the entire process of IVF each step is a hurdle that has to be negotiated successfully. For example, not all women respond to ovarian stimulation, not all eggs are mature, not all eggs fertilize to make good embryos and not all embryos implant. Therefore, there is an attrition or drop out at each stage. It is at the stage of implantation that there is a huge scope for further research. Implantation is the process where the uterus accepts the embryo which then develops to form the baby. Much work has been done on this aspect of IVF and medications such as steroids, aspirin, heparin, sildenafil are being tried to improve implantation rates. The overall success rate of IVF is about 40 % per treatment cycle. In order words, 4 out 10, who otherwise had given up all hopes of parenting a child would conceive after attempting IVF. The World over the success rate is highest in younger women where it can reach up to 60% per treatment cycle. In the case of failure, IVF may be tried again and the cumulative pregnancy rate over 3 cycles may go as high as 80%. In order to give the optimum benefit to the patient, it is essential that the infertile couple is offered the right treatment at the right time. It is also essential that patients understand the entire process of IVF. We are in an era of transparency and constant dialogue with patients. They should be involved in decision making. They must understand the strong points and drawbacks of the entire IVF process. Once there is a complete understanding of the process a lot of stress associated with such intensive treatment will automatically be allayed. IVF (in vitro fertilization) or ‘test tube baby‘ is the magic word for infertile couples desperately desirous of a child. Through this technology which is a boon to mankind, many who had no chance of having their own child, are now proud parents. Failure of Fertility treatment for more than 2 to 5 years. In best cases (good sperm, egg and uterine quality) the success rate may reach up to 50-60%/attempt and 90% in 2-3 attempts. However, where quality is not good success rates are lower. Ovarian stimulation consists of daily injection of hormones to the female partner with frequent clinical and ultrasonographic monitoring. This usually continues for 10-12 days. Egg retrieval is performed under anesthesia through the internal route.There are no incisions or scars. The egg and sperm are either mixed (IVF) or the sperm is injected into the egg (ICSI-intracytoplasmic sperm injection) . The fertilized egg forms the embryo. The embryo is cultured in the laboratory for 2-3 days . Two-three best embryos are selected and transferred into the womb (uterus) on the second or the third day. Day 5 transfer (Blastocyst) is decided on case to case basis. The pregnancy test is done 14 days after the day of embryo transfer. One IVF cycle takes about l5 days from start of period to embryo transfer. In this case, you need to reach 3-4 days before the period starts. Many patients may not be able to spare so much time. If you collect your medications from us in advance your stay can be reduced to a week to 10 days around the time of embryo transfer. In this case, you can reach on the 7th or 8th day of your period. You can travel back 2-3 days after embryo transfer. We are sure that travelling does not reduce the chance of pregnancy. It takes 15 days from the embryo transfer to obtain the pregnancy test result. The total number of visits may vary from 4-6 usually. There is no overnight hospitalization and both egg pick up andembryo transfer are day care procedures. Husband needs to come on day of egg pick up or freeze sperms beforehand.